Everyone has an opinion on the Harley-Davidson Street 750, but that hasn’t stopped it from being a big seller for the American marque. 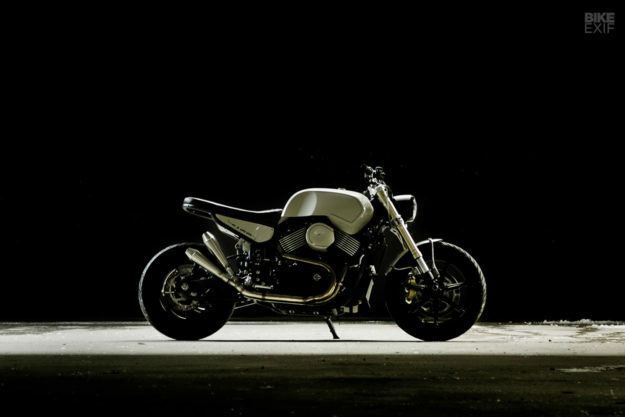 And most customizers who have spun spanners on the Street will say one thing: lurking under all the nitpicks is a pretty decent motorcycle. 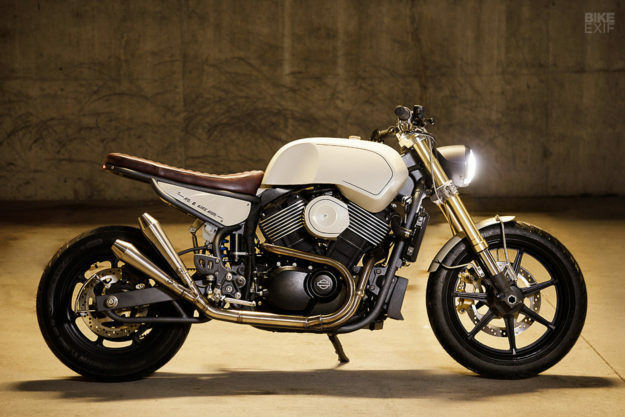 There were two major requirements for the Street 750: it needed to be thoroughly rideable, and it needed to have a little cafe racer flavor—in the broadest sense of the term. So Colin knew that the 2015-spec Harley would need all-new bodywork, and a few performance upgrades. Other hand-made bits include the side panels, front fender, a rear splash guard, and a battery box. Colin also lopped off the entire subframe, then whipped up a new one using a manual tubing bender, a tubing notcher and a TIG welder, leaving a notch in the back for an LED tail light. 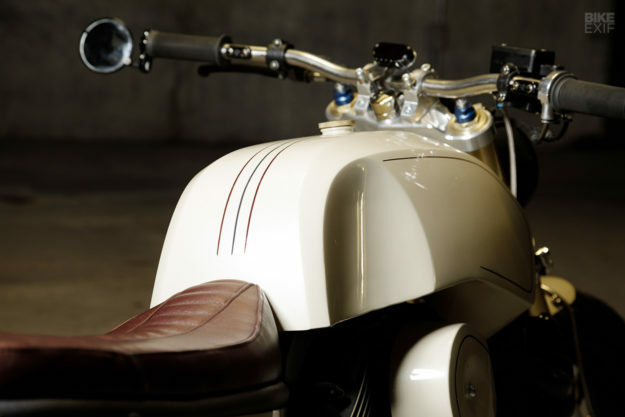 New Church Moto handled the oxblood leather seat upholstery. 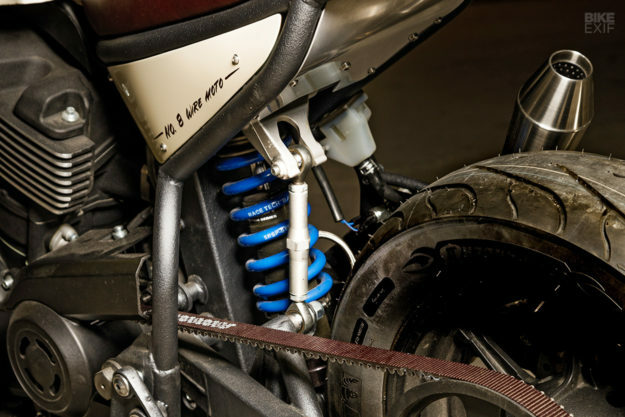 Colin rebuilt the swing arm to fit, then turned to Racetech in California for the shock. They custom-built an external reservoir G3 unit. There’s some out-of-the-box thinking on the front end, too: “There aren’t any kits available for the Street,” says Colin. So near-neighbor Mike Manhardt of Acuity Design was roped, helping to design and CNC a custom upper triple clamp and steering stem. It now accommodates the front end from a 2005 Suzuki GSX-R750. Those are the big mods, but there’s a ton of small stuff going on too. 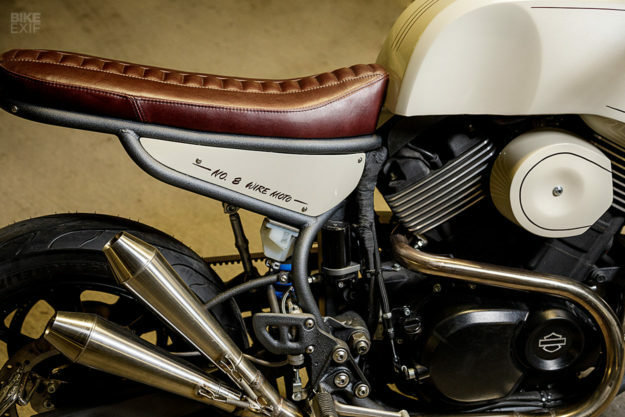 Colin’s handiwork can be found on the stainless steel fender braces, the license bracket, the hand-bent coolant lines, the aluminum headlight mount and even the custom-machined steering stem lock nuts. Colin even hand-bent his own low-rise handlebars, then equipped them with micro-switches, Biltwell Inc. grips and bar-end mirrors. 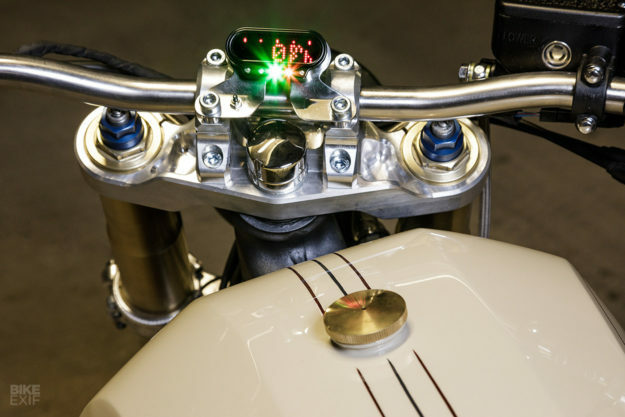 There’s a neat little Motogadget speedo, mounted in a hand-made stainless bracket. 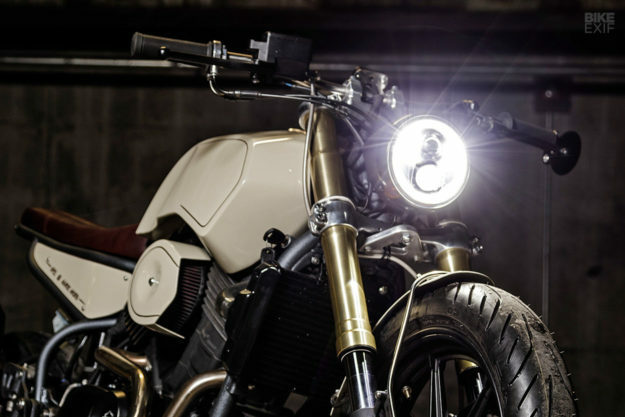 An LED headlight lights the way, with discreet LED turn signal strips mounted around the forks. 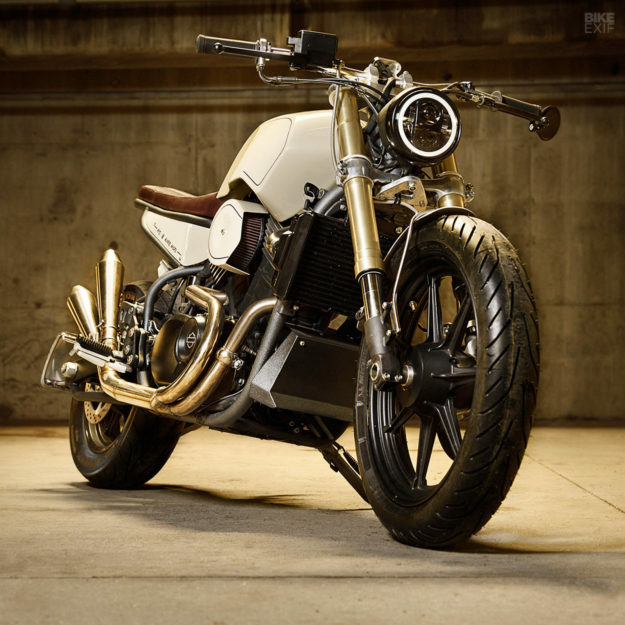 To squeeze a little more power out of the XG750 motor, Colin also fabricated a two-into-two, TIG-welded stainless steel exhaust system, finishing it with a pair of Cone Engineering mufflers. 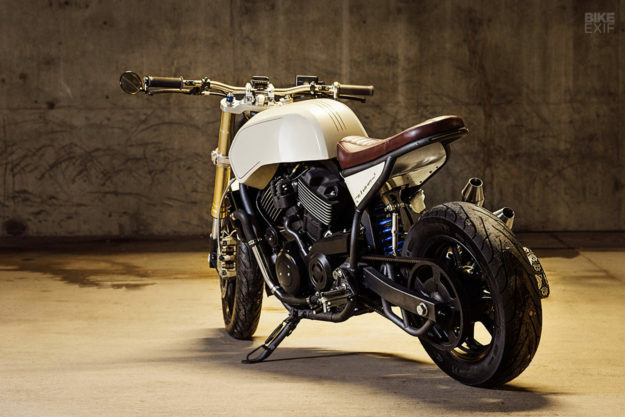 He then installed a Vance & Hines high flow air cleaner (with a custom-made cover) and a V&H ‘Fuelpak’ ECU. “The bike sounds great, runs great and absolutely rips,” he says. All that was left was to apply a fresh coat of paint for the frame and bodywork, along with a little pin striping, which was handled by a couple of locals. 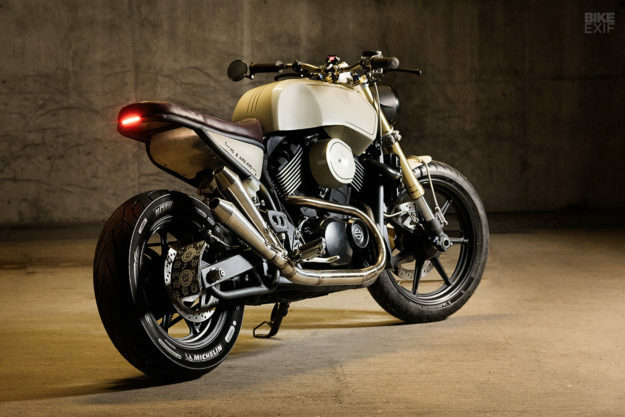 This Street 750 now has a brawny new stance with performance to match, and it’s great example of the donor bike’s potential. Colin’s client is reportedly chuffed, but he’ll have to wait for delivery. The bike’s going to Portland, Oregon for The One Show in a few weeks, before it heads to its new home.